Today’s decision by the Bank of England to hold the Official Bank Rate at 0.5% for the 17th month in a row was so predictable that I nearly didn’t bother posting today. As I’ve been saying for a while I think they are going to try and inflate some debts away but I’m starting to become concerned by this strategy for a number of reasons. This is what they say however I don’t think the message is consistent. Let’s now look at my first chart. 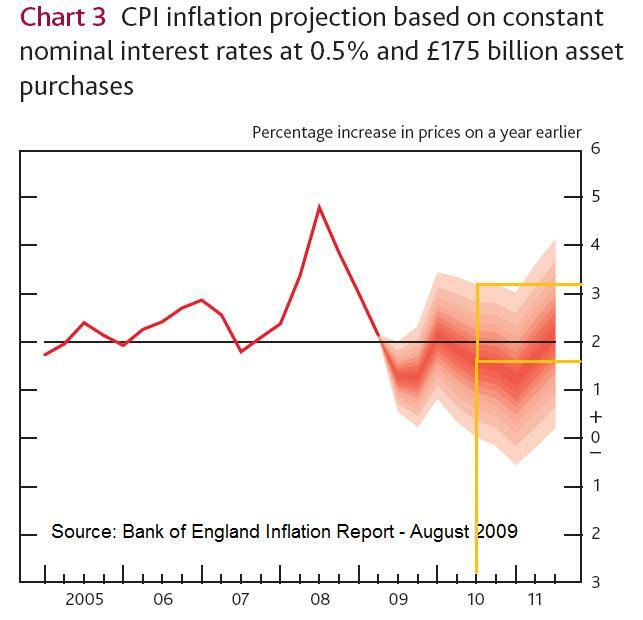 This is simply cut from the Bank of England’s Inflation Report however I’ve gone back 12 months to the August 2009 release. In this report they show a lovely fan chart showing what they expect to happen to inflation over the next couple of years. The assumption they made was that interest rates would be held at 0.5% (well they’ve done that so far) and that they would undertake £175 billion of quantitative easing (well they’ve done £200 billion which should if anything give higher inflation expectations). The orange lines are mine. 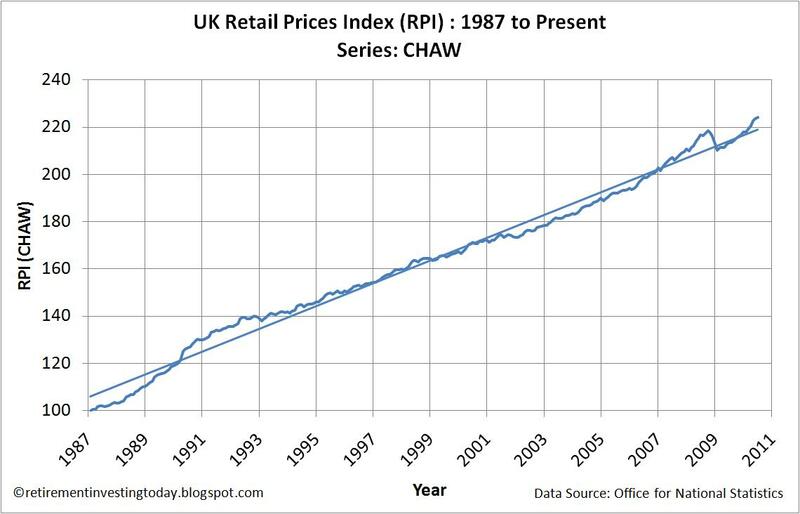 Back then they predicted by June 2010 the CPI would be at 1.6% nominally, which they clearly have been very wrong about, with the highest upside risk being at 3.2%. 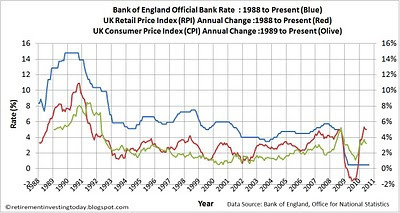 My second chart shows the Bank Rate being held at 0.5% and shows the RPI at 5.0% and the CPI at 3.2%. So we are at the Bank’s worst case on the fan chart. As an aside, if in my work life my estimates were out by 100% I would be sacked however that’s for another day. (For completeness chart 3 today shows the long run RPI index as I show every month.) Where it now gets interesting is we stay on the worst case line and have a look where this heads medium term. I’ve never seen a definition from the Bank of England of what medium term is so to make it easy let’s look at what happens over the next year. Firstly inflation dips to maybe 3% by year end and then continues to climb to over 4%. 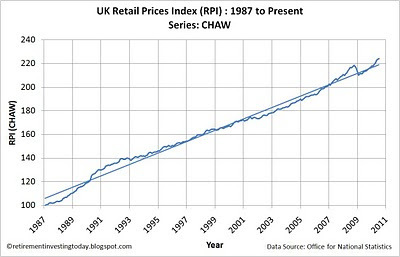 Remember that is not my chart that is direct from the Bank of England and it doesn’t look like inflation returning to target to me. 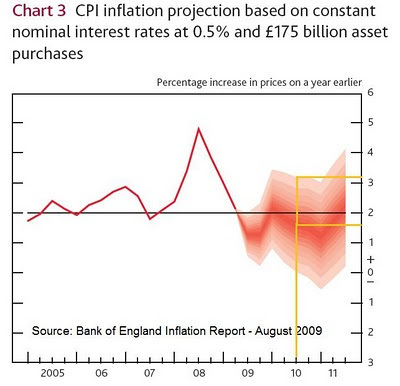 So inflation is higher than target today and the Bank of England 12 months ago said it would go higher over the next year. Shouldn’t that cause an increase in interest rates? Secondly, we have just heard the “wonderful” news that GDP for the 2nd quarter of 2010 was 1.1%. I appreciate that this is only preliminary. I think I remember reading it was based on 40% or so of data released. To put this in perspective though I’ve gone back and looked at GDP data since 1955. What do you think the average quarterly GDP figure is? Well it’s 0.58%. So GDP is currently running at twice the average. How far down can they revise it? I wouldn’t think to 0.58% which would be an economy that was neither booming nor busting. Could there be a risk if this continues of creating another boom (which of course will lead to another big bust)? So GDP is a lot higher than the long run average. Shouldn’t that cause an increase in interest rates? Thirdly, let’s look at what’s happening in the real world. We have the VAT increase to push up prices coming soon. Next have announced price rises of 8% next year due to higher cotton prices and the VAT increase. Premier Foods, who own the Hovis bread brand, are also starting to suggest that bread prices are going to go up as wheat prices are increasing. Of course, I’ve also mentioned in the past that I can’t see the cost of Chinese made goods going down either with the wage increase pressure that they are seeing. So all of this looks inflationary. Shouldn’t that cause an increase in interest rates? But do you know what I don’t like the most. I can live with the Bank stealing from me by inflating away the value of my savings. I can live with the Bank helping the reckless government and excessive borrowers by inflating away their debts. What I don’t like is the risk going forward. Tht is that we end up with yet another boom with these ultra low rates. Then the bubble is pricked and we get the bust. The Bank then has nowhere to go with rates because they are already at record lows. What do they do then? My guess is that they reach for the quantitative easing handle however that starts to sound all a bit Zimbabwe for my liking. 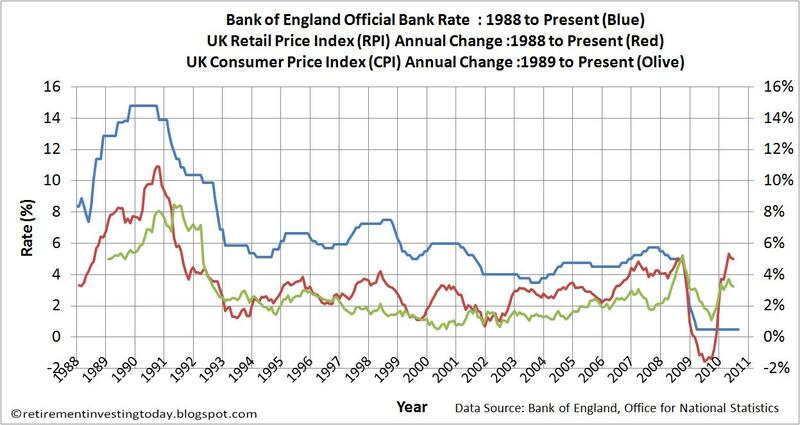 I don't think that the BOE are inept. I think they have a very precise agenda to inflate away government debt at our expense. Their explanation for this operation is that they are setting the QE rate and the base rate according to what they forecast the future inflation rate to be at. Of course in retrospect, their explanation will be that inflation cannot be accurately predicted and that they did their best. Now that we have been informed by Mervin King that the UK will be high inflation low interest rate environment for at least the next two years, I am now considering other options outside of GBP. I am also wondering whether I should join this party and max out a 0% for one 1 year credit card to buy some gold with. Of course, leveraged investments are against my personal policy but this situation has become very concerning. I just had a quick look and I currently have 57% of my portfolio located in sterling based investments. They are Index Linked Gilts, Index Linked Savings Certificates (ILSC's), UK Property, UK Cash and UK Equities. I personally am not changing my strategy at all based on the BofE decisions and am simply following what I regularly blog about. I'll put a monthly allocation summary up on the blog hopefully within the next week. The problem I have is that in the near future I am going to need to find for new money something that can replace ILSC's now that they are withdrawn. That's not going to be for a while so hopefully they might come back by then. I personally am not using any leverage for my investments. In the past I bought a leveraged commodity ETF and was badly burnt by both leverage and contango. Wishing you well with your investments. It would be great if you let the blog know what you finally decide to do and how it performs over time. My thought were more of a reflection that an statement of intent. Part of investing (as far as I am concerned) is having the discipine to stick to a long term plan. I think as soon as one starts to react to the short term, it's a down-hill spiral from then on. 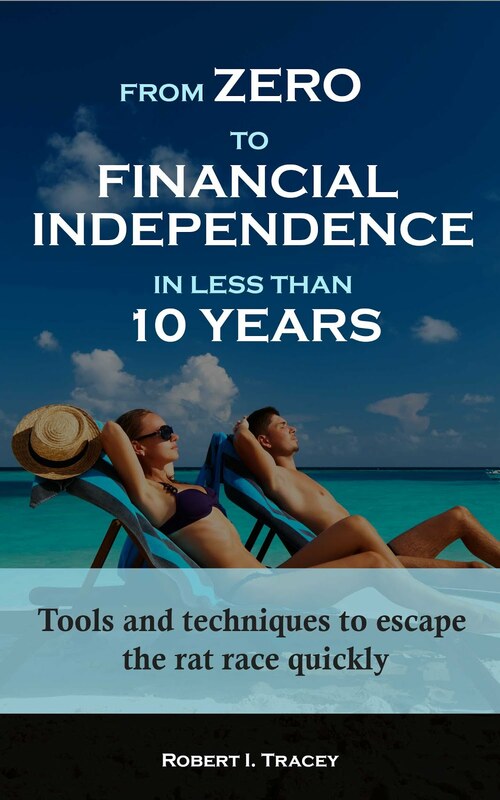 I am not in the business of speculation, as far as investing for my retirement is concerned. However, I have a property deposit fund that I treat as being completely seperate to my retirement portfolio. I am concerned because I just don't know when I will use it, and I hate the thought that each day it's sitting in my cash ISA, it's loosing value. I have not experimented with leveraged investments. I nearly gave FX a go, but decided against it. 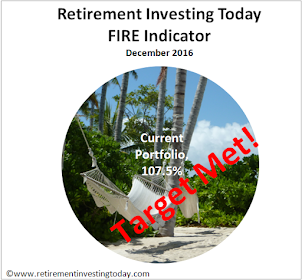 As I am still at the very earliest stages of building my retirement portfolio, I want to contribute as much as possible to it, as any funds invested now have the best of 30 years to compound and grow. The inflation/interest rate situation I find very frustrating, as you can gather from my previous postings. I am also exceptionally frustrated with the inflation/interest rate as I'm sure you have already gathered from my posts :-) Sometimes it really does feel like I am giving my savings away.